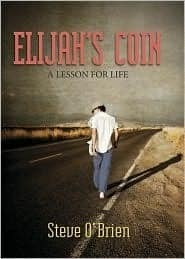 A small book with a big message, Elijah’s Coin was a surprise. Opening with the main character, Thomas Wagner, contemplating a break and enter and the events that led him down a darker path. After breaking into a local store he is caught and confronted by Elijah King, a mysterious man who gives him a choice to listen to what he has to say and go free, or he calls the cops and he goes to jail. Obviously, he listens. Elijah gives him a coin and a set of rules for life. Then Elijah disappears after their second meeting. Tracking down other men who are some of Elijah’s chosen few, Tom is set on finding out more about these life lessons. What he finds changes him on so many levels and leads him down a new path. A billionaire, a successful lawyer and a man who runs a soup kitchen, all touched by Elijah’s message. The coin, stamped with G2G on one side and a rising sun with the initials EK on the other is another mystery altogether. After reading this book, I found myself contemplating Elijah’s rules, “Observe, Think, Believe and Act.” Observe a problem, Think about the Solution, Believe you can help and Act to achieve the goal. G2G means Give 2 Get and is truly the deeper meaning of the book. I won’t give everything away here but there’s so much more for you to discover. Part parable, part self-help, this would make a marvelous book to give to a troubled teen. I also was surprised and pleased to find two coins in the back of the book – one for me and one for someone else – Elijah’s coin. What a wonderful site! I’m your new follower from the blog hop. It would be great if you had time to check mine out!